Located on a natural peninsula 60 minutes from Muscat, Al Madina A'Zarqa (previously known as The Blue City) is a 32 square kilometre (12.36 square mile) waterfront city being built along 16 kilometres (9.95 miles) of shoreline adjacent to the Gulf of Oman. Al Madina A'Zarqa is more than just a resort real estate development; the city is being designed and built to include all the elements needed for a thriving metropolitan community with a population of 200,000 people. 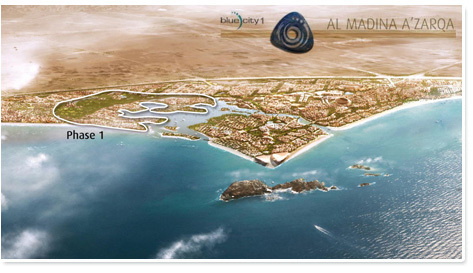 TPL's design will capitalise on the unique location of the course, sitting as it does adjacent to the Indian Ocean and the Al Khor. Design development is ongoing with construction commencement in 2010.